Object: Touring Group of the Vienna Boys’ Choir. 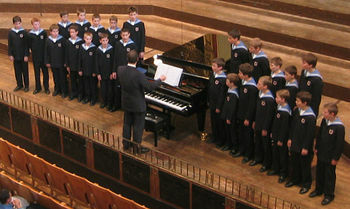 The Vienna Boys’ choir is divided into four touring groups (Named for Bruckner, Mozart, Haydn and Schubert) each containing about 25 boys between the ages of 10 and 14. Approximate weight of each touring group: 1750 Lbs. Approximate weight of total group: 7000 Lbs. The Vienna Boys’ Choir Weighs More Than Me. This entry was posted in Uncategorized on August 2, 2009 by fatchicksings.